Today’s Pocketmint topic was inspired by Dogs or Dollars, where there’ve been recent conversations about the frequent conflicts between one’s budget and one’s beliefs, especially as relates to food for both humans and pets. I believe in farms owned and worked by families or co-ops, not owned by corporations and worked by underpaid slaves. I believe in humane treatment of any animal with a brain complex enough to experience misery. I believe in protecting our planet’s ecosystems, rather than trashing them for short-term gain. Sometimes, I put my money where my morals are. I’ve written before about my switch to buying only environmentally-sustainable seafood, and the changes I made in order to offset the higher cost. I also support local farms with my annual twenty-week CSA subscription. This is expensive. I stopped trying to calculate exactly how much more expensive, because it’s just too complicated, but it’s definitely more than double what I would pay for the non-organic equivalents in the grocery store. I can tell you that my final cost this year, after various discounts, is $26.16 per week. About $110 per month, or one-third of our grocery budget. It’s a conscious choice that I’ve made three years running. I’m voting with my dollars. Nevertheless, I still flinch at the cost. Not just once in the spring when I hand over nearly $600, but every single week for twenty weeks. I’m anchored at grocery store prices. 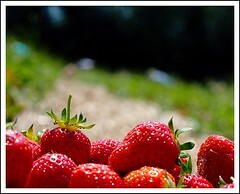 And although sometimes the CSA quality is better (strawberries with actual flavor!) more often it’s indistinguishable (zucchini is zucchini is zucchini). So the tangible benefit alone does not offset the increased expense. I cram all of my produce-related virtue into those twenty weeks. The other seven months of the year, I buy from grocery stores and prioritize cheap. I do my best to buy local and in-season, as those complement thrift rather than conflict with it. But I almost never spring for organic. And in any case, I have to assume that even the local stuff in the grocery store is primarily sourced from large corporate farms. I am mostly able to sidestep the issue of factory livestock because I’ve made the personal decision to not eat meat or poultry. Jak is happy enough to have someone else do all the shopping and cooking that he doesn’t mind the dietary restriction. So we are contributing far less to the problem than most Americans do. But there are exceptions. Two glaring and constant exceptions, in fact, plus a couple of occasional deviations. 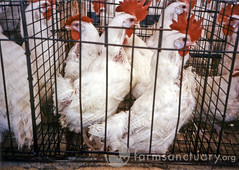 Most of the eggs we eat are factory-farmed. This bothers me, but I can’t justify a 500% price increase in a staple food, quite aside from the additional time and difficulty of acquiring them. I am looking for alternatives at a lower price point. Even though I don’t see myself ever keeping chickens, I am cheering on every backyard coop in the city, because the more people I know with too many eggs, the better my chances. I will barter. I would pay double to get ethical eggs, maybe more. But so far, it hasn’t been a consistent option. I feed my dog and cats kibble made with factory-farmed poultry. I already pay extra to get kibble that isn’t primarily grain and filler, for health reasons. That means more meat, and I am under no illusions that the meat had a tolerable life. Even when I was splurging on a part-raw diet, I chose the cheaper ‘conventionally-raised’ poultry over the free-range organic. Because $1000 a year in food for one medium dog is just too much for us. Now that I no longer buy the professionally-mixed raw dog food, I occasionally will buy a cheap package of chicken wings to supplement Tessa’s diet, out of concern that she doesn’t get enough protein from the kibble alone. Once in a blue moon I’ll buy Jak turkey lunchmeat from the deli if it’s on sale. I have no excuse for that except that it’s a nice treat for him. I draw the line at mammals — no bacon in this house. But yeah, some of our grocery dollars go to support mistreated birds. I think about this every single time I buy any of the above things. I never stop thinking about it — questioning my decisions, considering different sacrifices, looking for ways to move my financial support away from a practice I believe is wrong … without skyrocketing our cost. I have some longer-term ideas for change. It’s an evolutionary process. Do you compromise your budget for your beliefs, or the other way around? Or have you figured out a way to honor both? There is a company I believe is evil and I have boycotted them for years. But, I’ve not hesitated to draw storyboards featuring this company for my client who has them as an extended client. That’s an interesting example; I hadn’t been thinking in terms of income, only outgo. It’s a luxury, I think, to not have to choose between principles and a paycheck. The CSA I belong to has a tiered payment system. My unimpressive-for-NYC-income is at the highest level and I’m happy to pay extra to subsidize shares for people in lower income brackets. I wonder if this is something you can find in Seattle. That’s very cool, Meera. I don’t think any of the CSAs in Seattle work like that; it’s definitely more of a yuppie luxury option, here, not a public service. However, I will be paying less next year. I’m going to downsize, for one — since we are at base a household of two now rather than three to four. Its an exhausting and constant negotiation. I think the best we can do is be real about it. Honest. Open. About the trade-offs we all choose to make and why. Even if we know we could do better. Or we would do better, if we could. I think talking about the compromises honestly helps keep us from becoming complacent about them. Seriously, I was looking at chicken-farm photos to illustrate this post (I avoided some of the more unpleasant ones) and I was more deeply and viscerally appalled about the situation than I’ve felt in a while. I haven’t eaten meat, chicken, or seafood in seventeen years, so I get to sidestep some of the ethical questions involved with humane treatment of animals raised for slaughter. I do pay rather high prices for small-farm co-op organic milk, but that choice is harder to find in cheese, and the egg issue is confusing since a lot of “Free Range” claims have been found to be spurious. I’ve given thought to going vegan, but so far have not. I do choose organic fruit and vegetables frequently, but not exclusively. In the end I can only compare myself to myself, and I’m making healthier and more ethical choices every year. I’m recently unemployed, but willing to keep my food budget a bit higher to keep making better choices. In my personal experience, budgets always contain opportunities to rearrange priorities.